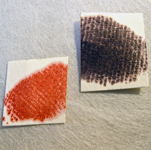 All dyes are tested in three solutions to determine their wash fastness (below, center). Edge cords, any repairs, labels, ink marks or touch-up are tested (below, right). 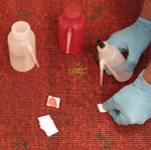 Rugs - or parts of rugs - are cleaned accordingly in order to avoid any bleeding of the color. 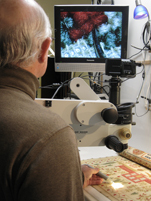 1) Microscopy is often used to verify authentic, repaired or counterfeit material. Here is a rough old repair of a Peruvian mantle (below, left). The wefts appear to have disappeared - leaving only the warps and a "shredded" look. 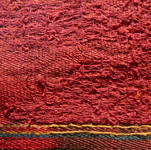 The "warps" are couched to a backing cloth. 2) A closer look at the fibers reveals that the original body of the manta is woven from alpaca fiber (above, center), while the repair was done with cotton fiber (above, right). 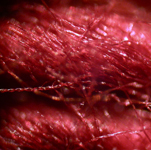 The cotton yarns simulated the look of the textile and were simply laid against a backing cloth and sewn down. This repair gave a false impression that much of the textile was still intact. In this case, the buyer did not realize that the missing alpaca had been replaced with a similarly dyed cotton material. The condition of all textiles and rugs is documented. Here a camera mounted overhead is being remotely controlled on a computer via a USB connection. A Gabbeh Oriental rug can be seen on the screen (above). It is being photographed to document special aspects of its condition. 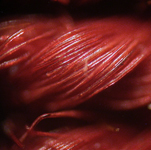 The overall photographs are augmented with detailed photos taken with a macro lens. Our Wild M650 surgical microscope is useful for many applications. In this photo (above) it has been tethered to a monitor. 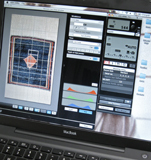 Precise work can be observed and recorded with digital photos or videos. 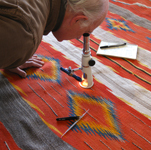 Here removal methods for glue are being tested on an early sampler.